Blood of Heirs tells the stories of two heirs, Lidan and Ranoth. Fist we meet Lidan, a thirteen-year-old girl who is currently the heir to her father, Erlon Tolak, Daari of the Tolak clam because she had no brothers. Or at least, not yet. Lidan spends the book desperately trying to earn both her father’s love and her mother’s approval while also satisfying her mother’s thirst for position. She is caught between parents who seem forever disappointed in her and she fights for the chance to be seen as heir because she is worthy regardless of her gender. Ranoth also has a father who he is desperate to impress. The Duke of Orthia is cold and demanding, making it clear, repeatedly, that he finds Ranoth wanting. This situation only worsens when Ran discovers that he is a mage – all magic is banned in Orthia, seen as a curse that cannot be cured. To avoid being executed by his father, Ranoth escapes into the wilds where he must avoid the soldiers out searching for him while surviving the winter with little other than the clothes on his back and a ghost who follows him around offering suggestion he largely ignores. The two story lines proceed separately throughout the book, culture, customs and location keeping them separate, the only link other than the fact that both characters are heirs being the monsters which hunt Ranoth and are attacking rangers and villages in Lidan’s lands. I liked both of these characters and both of the story lines, but I struggled a little with how separate they are. It felt like reading two books at once in some places and even by the end, when it’s clear that they are both facing the same monsters, it still felt quite disconnected. This book is clearly the beginning of a series and I’m looking forward to reading the next one – despite any criticisms I might have, I did enjoy this book and I do want to know what happens next. Typical writing advice is for the first book in a series to be capable of standing alone while leaving enough open for a sequel which is, personal experience included, really hard to do. In this case, I feel that the author missed it a little. 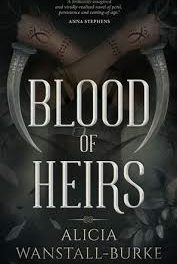 I felt that Blood of Heirs didn’t quite stand alone. Some questions have been answered but many more have been raised and it didn’t feel like it came to a natural conclusion for me. I wanted more. The prose is fluent and flows well with some particularly nice turns of phrase in places. The worldbuilding is rich and layered with customs, dress, ritual and hierarchy all feeding into a well textured world. The two main characters are both sympathetic and interesting and I definitely want to know what happens to them next. A strong debut and I look forward to reading more by this author.